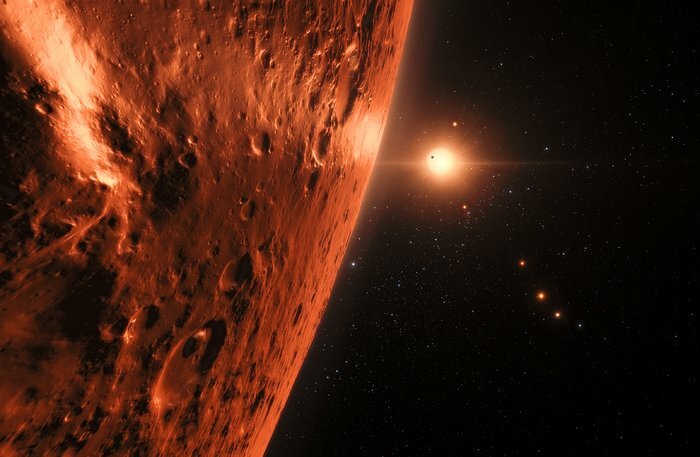 August 31, 2017 – An international team of astronomers used the NASA/ESA Hubble Space Telescope to estimate whether there might be water on the seven earth-sized planets orbiting the nearby dwarf star TRAPPIST-1. The results suggest that the outer planets of the system might still harbor substantial amounts of water. This includes the three planets within the habitable zone of the star, lending further weight to the possibility that they may indeed be habitable. Following up on the discovery, an international team of scientists led by the Swiss astronomer Vincent Bourrier from the Observatoire de l’Université de Genève, used the Space Telescope Imaging Spectrograph (STIS) on the NASA/ESA Hubble Space Telescope to study the amount of ultraviolet radiation received by the individual planets of the system. “Our results indicate that atmospheric escape may play an important role in the evolution of these planets,” said Julien de Wit, from MIT, USA, co-author of the study.